Is It Okay for Me to Wear Naots? Naots are very cute and comfortable shoes made in Israel. 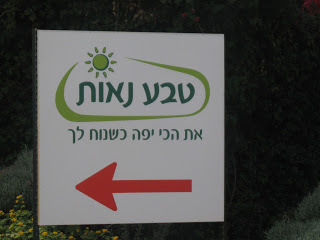 The people who make Naots in the Kibbutz Neot Mordechai are surely good people who are simply trying to make a solid product and live their lives in peace. But the soles of Naot shoes are made in Gush Etzion, just south of Bethlehem in the West Bank and Gush Etzion is considered illegally confiscated Palestinian land by most readings of international law. Others say that the land was purchased by Jews long before the Jordanian invasion in 1948. Do we, as a denomination, support the Palestinians – some of whom are our Christian sisters and brothers – whose homes have been bulldozed and whose land has been taken? Do we, as a denomination, divest our pension monies from businesses like Caterpillar whose tractors do the bulldozing? Again, this is ridiculously simplistic but we Presbyterians are trying to do the right thing. None of us are purists – let’s be clear about that. While I might not wear Naots, I have owned a Hewlett Packard computer and HP is another company from which my denomination is considering divesting. This has been very ugly. And I have no good answers. But I’ve come down to this: I – myself – can choose to practice spending my own money as a personal spiritual discipline a la Julie Clawson. Perhaps this is the wimp’s way out but it’s often the best we can do. And none of us will ever be purists. We just can’t do it. If you can comment calmly, where are you on divestment? Image source: The Naot Outlet in Israel. I agree that it is complicated and a passionate topic for many – on both sides! It is further complicated by globalization. The interactive web of each company makes divestiture seem an impossible task. I would submit that it was not the Presbyterians who rendered this ugly. I support divestment as a nonviolent form of action.